This is kind of a mystery radio show for us. Most of the time when you find a song folio book of the old radio shows, you'll see many pictures along with some writeups about the stars and the show itself. But, in this case, all we have is the folio and the pictures with names of the artists. Mysterious as it maybe, one of our guests was kind enough to shed some light on this show. WJJL was and is a radio station in the Niagara Falls, New York area. The folks we see in the photos here were mainly local artists and groups that played in the area at the varioius venues such as the bars, schools, etc. 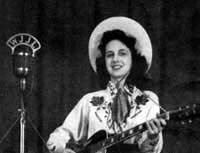 On Sunday afternoons, they would hold the WJJL Jamboree, then a 1,000 watt radio station. 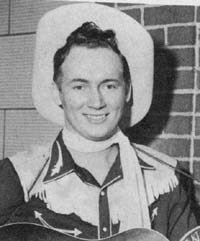 The Ramblin' Lou we see in one of the photos from this song book is none other than Ramblin' Lou Shriver who had a morning disc jockey show over WJJL from 6:00am to 9:00am for many years and also promoted country music shows. 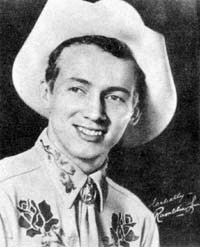 Ramblin' Lou now owns radio station WXRL (1300 on the AM dial) out of Lancaster, New York and was inducted into the Country Music Disc Jockey Hall of Fame in 1985. Now the interesting thing is that inside the covers, the pictures are all of Jenny Lou Carson, the infamous songwriter and performer on the WLS National Barn Dance. 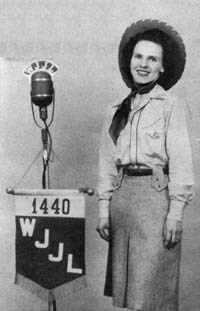 But even with all her pictures, there's no mention of the WJJL Jamboree. 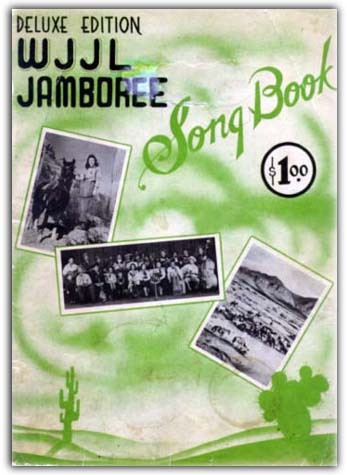 As for the song book itself, well, it appears it was a promotional deal whereby the artists / show could use their photos on the covers and then sell the songbooks as sort of souvenirs. But that didn't necessarily mean they had any connection to the songs in that folio. Which may explain why we see so much of Jenny Lou Carson in this folio but not on the covers. And a tip of the hat and thanks to one of our site's guests who was a part of the show and was gracious enough to give us some details.